Description of "Gita Bhaav Prasad"
“GITA BHAAV PRASAD” is a complete solution for all GITA lovers who wish a regular -daily reading of the pious book with a perfect understanding of its inherent meaning and thoughts. 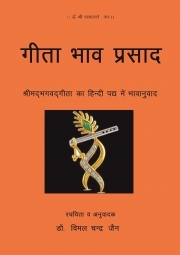 GITA BHAAV PRASAD is Shrimadbhagvadgita’s translation in HINDI verse [poem] along with original Sanskrit text and full of melody in singing. foundation to all world religions; climax of all cultural, religious and spiritual philosophies; dignity and pride of India and a most suitable book for obtaining peace, self purification, spiritual upliftment and salvation. Reviews of "Gita Bhaav Prasad"